Whether you’re a traditional collision repair shop or a PDR business, it can be challenging adjusting your workflow. Even within some of the most successful businesses, there are constraints that could be tackled better. 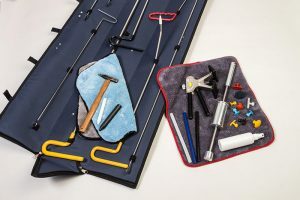 A good way to improve on your PDR workflow is by looking at all areas of business, but before you can even consider that, you should prioritize connecting your PDR technicians to your back-office and to whoever is handling the customer invoices. In PDR, speed and efficiency play the biggest role in how much your business will make on a daily basis. Once you understand this, you can begin to look at how you can re-organize your business’ workflow management system. Fortunately, because of the already fast nature of PDR, it’s pretty easy to adapt to a more efficient management system. While PDR is already a lucrative and fast endeavor, better workflow in all aspects, especially the back-office, will not only increase the number of vehicles you work on in a day, but also make it easier for your technicians. In the PDR business, the back-office is one of your biggest headaches. You don’t want to spend hours on paperwork, but you also don’t want to track invoices, estimates, employee compensation, or more based on information that isn’t completely accurate. What you do want to track, though, are PDR estimations and the exact amount of hours your technicians are spending on each repair. Beyond that, you’ll want to look at it all in real-time to accurately measure how you can reduce your cycle time and increase throughput. No matter what, it’s important to use a database to track and record important information about the vehicles you’re working on. First thing’s first, in 2019, your PDR business shouldn’t be relying on spreadsheets, dry-erase boards, or even sticky notes. They can get easily lost or misplaced, and create unnecessary bottlenecks in your workflow. Right now, the most successful PDR businesses out there are using management software to track their entire PDR process from estimate to the paid invoice accounting entry. Management software applications can manage your entire workflow, invoices, estimates, upload documents and photos, track individual vehicles, customer pricing, and employee commissions. After you’ve improved on your workflow management, simply embrace the newest technology available. For a lot of PDR businesses, the biggest constraints lie in the back-office. Whether it’s misplaced paper, poor filing, or communication issues on approvals, the back-office is definitely one of the biggest struggles for anyone in PDR. AMT offers software solutions designed to make your PDR business more efficient, provide you with better visibility, and give you peace of mind knowing that your back-office is always up-to-date. ReconPro is the industry’s most versatile and powerful software solution purpose-built for auto recon professionals. With essential tools for performing estimates, hail/PDR and insurance matrixes, parts management, paint code lookups, integrations with body shop crash systems and accounting systems, too. ReconPro manages the details of running your business so you can focus on growing your business.